Stearn Guitars creates custom handmade guitars. We specialize in crafting quality baitone, parlor, and acoustic guitars in the heart of the Russian River. I began my guitar making career by purchasing a Martin kit guitar from Stewart Macdonald. I never even pulled it out of the box because, in the process of researching guitar-building on the web, I learned that there were many guitar-making schools out in the world, each offering various approaches to the craft. I was in my 3rd and final year of teaching high school English and found myself at a crossroads. I wanted to work with my hands; teaching, however enjoyable and rewarding, wasn't giving me that opportunity. So, after researching a few different schools, I decided to pack up and move to England for a few months with my wife and 12 month old daughter to attend the Totnes School of Guitarmaking. I grew up in my dad's custom furniture shop and worked with him for a while in my early years and even had my own custom woodworking business for a little while, so I thought I knew my way around a shop. Well, I did, but it was a modern American shop that I was familiar with; jigs, fixtures, power tools, etc., etc... 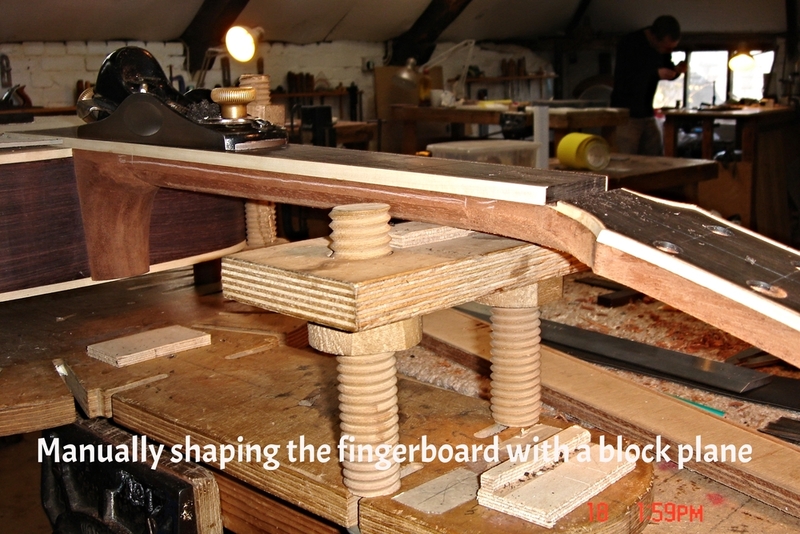 Within a week at the Totnes School of Guitarmaking, I realized that I really didn't know very much about working with wood. 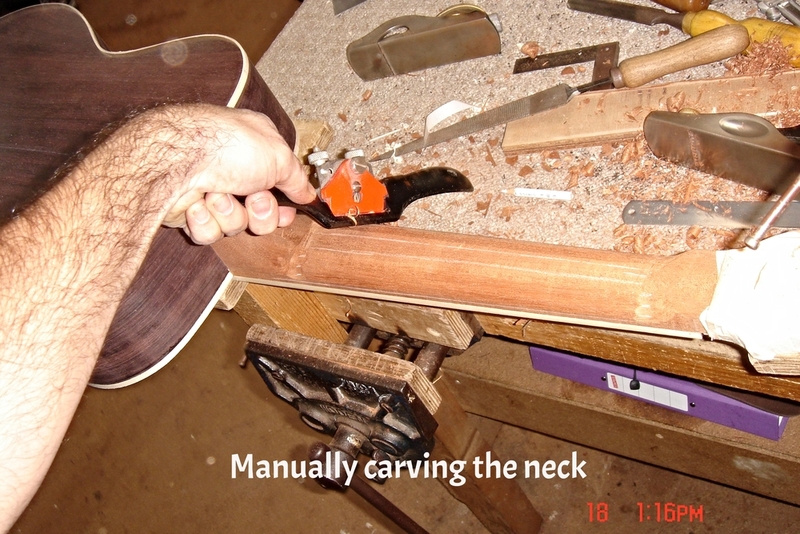 The only power tools I ended up using at the Totnes school, (and these were optional), were a router to rout out the truss-rod channel and the binding channels, and a "pillar-drill" (drill press) to drill the holes for the tuners in the headstock. Absolutely everything else was created using hand tools. Phil Messer, the owner and instructor at the Totnes School of Guitar Making is a master luthier, in the true sense of the word, and has laser-like precision with his use of hand tools. I don't think there is any stringed instrument that he could not make, and I believe that he could create a tighter joint between two top or back plates with a jack plane than any jointer or laser-guidered router on the market. I'm not sure how long Phil has been learning his craft, but I think it's safe to assume that he's been at it for quite some time. In the States, such a career, education, and apprenticeship, is a rare thing. All of this brings me to the main point of this post, which is really just taking a look at tradition and its importance, and how much we should or shouldn't adhere to it. I'll continue this on my next post. Thanks for reading and feel free to comment.